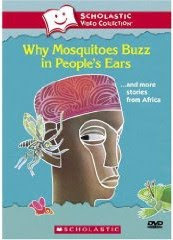 As we come to the end of February and Black History Month, I wanted to highlight "Why Mosquitoes Buzz in People's Ears" DVD that I found to shared with Daniel. Again, I'm loving the moving story book feel of the DVD. I also like that the stories are based on African folklore. While each story originally started as a book they are brought to life on the DVD with little bits of movement and audio details. All three stories are read with creativity, humor and joy. In the first story James Earl Jones laughs...it's amazing to hear! A great point about the DVD is the imagery of each story wasn't done as full action scenes. The DVD lets your child use their imagination to follow the story. The stories are also not long...10-12 minutes each. I'm not sure where at 20month's my son's imagination took him, but I know he gave his fully attention to each story. I recommend the stories...book or dvd format...for kids of all ages to enjoy. 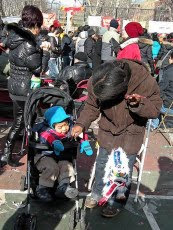 As we go into March, I am proud I found creative ways to share American Black History with my son. Even though I'm Caribbean, I hope to continue showing him how wonderful the African American culture can be. Being half black is something he should be proud of. He needs to know/see/understand that he's connected to a community of people rich in culture and creativity....past, present and future. When will we stop the food fight? I'm beyond tired of you say "NO" to me while Im trying to feed you. Further I don't think it's cute that you're now "hiding" from the food. Meal times is not hide and seek time. Honestly I cant believe we're having such an issue. People told me this time would come but I didn't believe it. You've always liked food and ate well. So to think there would be a time when you would refuse food? Not going to happen I told myself. 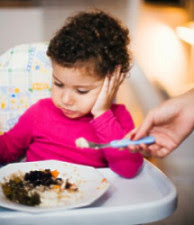 Yet here we are at each meal time having this power struggle. The books and experts say it's about you wanting to feel more control of things. *sigh* Trust me kid, you have control over more things then you know. Do we have to fight in the food area? Make multi meals in the hope that you might eat one. From Nov 2009 to now it feels that this battle has been going on a bit long. At least in my mommy mind. How much more kid? As I watch you run around and get into mischief, you don't seem to be affected by the missed meals. But I still worry. So can we find a way to call a food truce? Is there some kind of war time eating agreement we both can settle on? As I once again enter the battlefield...with this plate of chicken and rice...I hope we can. Soon! Have you ever been in a place filled with energy so powerful that your skin tingles? After seeing screening of the Crisis in the Crib: Saving Our Nation's Babies, a documentary by Tonya Lewis Lee, all the women in the room became of one mind, thoughts and intent. It was electric! Since I've already blogged about the screening and how I think it can affect the Asian and Black community, I want to talk more about what happened before and after as I met amazing women doing amazing things. 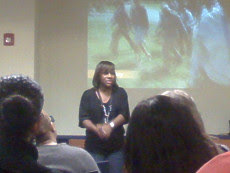 I was invited by Kimberly Seals Allers to attend the screening. Kimberly is a one women force for the female community. She's motivated by her love for black women and the black community. 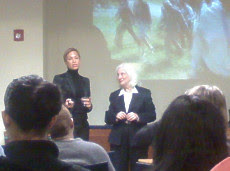 Kimberly explained how after speaking with Tonya Lewis Lee they both wanted to find a way to spread awareness about this plight of African American babies and hopefully bring about change. 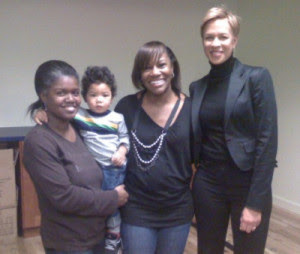 Tonya Lewis Lee is a women of change herself being an attorney, award-winning television producer, wife of filmmaker Spike Lee, and a spokesperson for the Office of Minority Health's "A Healthy Baby Begins With You" campaign since 2007! But even with all this she feels the bond of the motherhood. 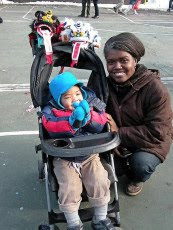 Tonya spoke of her experience as a mother and hopes that other black mothers will take their health and the health of their babies as a serious issue. I also meet the different women behind Women's eNews,...well, really Daniel met them first since he was running around their office saying hello. LOL. As I chased after him I chatted with each person learning their roles and more about the organization. I have to give a major hat tip to Carol Jenkins. 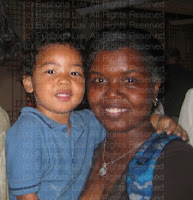 Carol and I shared a conversation about raising biracial kids in this culture. 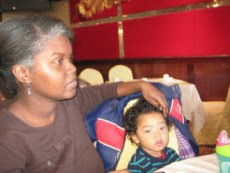 Carol's granddaughter is an adopted biracial child and her daughter encounters comments from people who think she should have adopted a "one" race child. Ah yes, people sure are bold right? 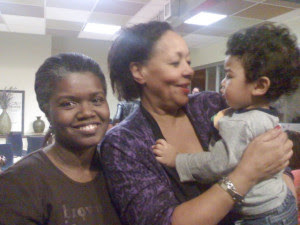 I also learned about different community organizations that focus on helping black women in all different stages. One women talked about using Yoga to help young women learn to be healthy, another women talked about helping black mothers who are recovering addicts, another helps protect the rights of blacks mothers in jail. On and on I heard from powerful advocates for the community of black women. All touched by this issue and willing to spread the word. Sadly, I didn't get a chance to speak one on one with as many as I wanted, since I had to get Daniel home. But I left the screening being inspired by the great things my fellow sisters are doing for their different communities. Go black women! Everyone loves a baby right? I told myself this was the reason behind why strangers felt the need to comment on my parenting. Unsolicited! While I admit some comments are helpful...sadly most are not. Some comments are down right mean and nasty. One man told me "some people shouldn't have kids" after I tried to stop my son from crying...and failed. What's the deal with comments like these?! Oddly enough it took another stranger who helped me understand why I get some gutty comments. After a full day of activity we jumped on the bus to head back home. Apparently Daniel chose this moment to make poo in his diaper. I don't have to tell you that fresh poo smells. Spanish WM #1: She was talking about you and how your not doing anything for him. That by the time you take him home it will be to late. Me: *sigh* We're on our home. What did she want? For me to change him on the bus? Spanish WM #1: I told her to mind her business. Unless she's willing to go buy the diapers and wipes then she should be quiet. Spanish WM #1: I hate people like that. People always have something to say. You know what it is...she just looks at him and doesn't see you. She thinks he's not yours and so wants to talk about you. I'm going stop the conversation right there. That woman doesn't know it but she made my life both easier and hardier. Nice to know that people attack me because they think I'm the nanny...not the mother. Seems being perceived as the nanny automatically gives strangers the right to judge me and share nasty comments. That's an interesting issue. If my son was brown like me would people turn a blind eye when he cries? If I was a white mom would I get supportive comments and the smile that says "I know how it is"? If I was Spanish like that women would she have been quiet? Hmm. I showed him how to put his hands into them. 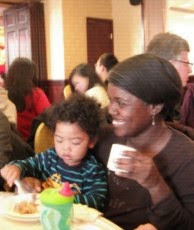 To celebrate the Chinese New Year I took Daniel for his first taste of Dim Sum. It's a Chinese tradition after all. Yeah we're not Chinese but I'll use any excuse to eat Dim Sum. LOL. 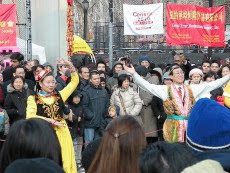 I also planned for us to see the Firecracker Ceremony & Cultural Festival also happening in Chinatown. 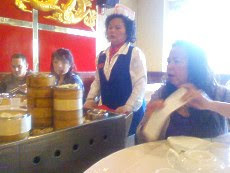 Before leaving I checked with Lai, my Chinese mom, to see if she was also having Dim Sum. She was and asked us to join her, her BF and family. Score! After fighting my way thru the crowds of people...people refuse to respect the stroller space...I found Lai at the restaurant and took my place waiting on line. 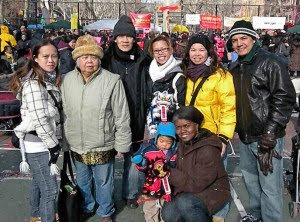 Being CNY all the families came out and the place was super crowded. 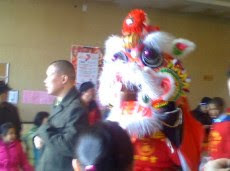 As we waited we watched the Lion/Dragon dancers who were going around blessing the restaurant (and collecting money!) for CNY. After literally pushing past people we sat at our table and got right to ordering. My friend Lai did all the ordering in Chinese since it's easier. As she rattled off dishes we wanted, I settled Daniel into his chair. He sat very well and just looked around at all the activity. After getting our Dim Sum I chatted with Lai about her recent travel trips while Daniel tried to use the chop sticks everyone else...but me...we're using. When he started poking people at the table, I quickly took the chop sticks away. Then he decided he'd use my fork instead. Let me tell you it's hard to eat noodle while he's grabbing my fork. Eventually I won the battle but Daniel's a bad loser and started to cry. For the next 3 mins everyone at the table tried all sorts of things to stop his crying. I just ignore it. LOL. Eventually he decided he'd rather get more food then have me ignoring him and stopped. We finished our meal and left to see the Cultural Festival. 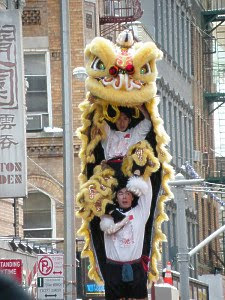 We made a quick stop along Mott street to see more Lion/Dragon dancing. 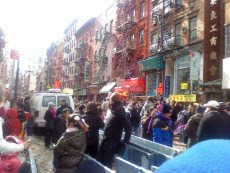 The streets were crowd with people shopping and seeing the sights of Chinatown. 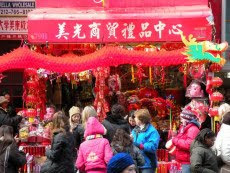 Many of the stores were beautifully decorated. We watch Lai's niece's pop tubes of confetti. 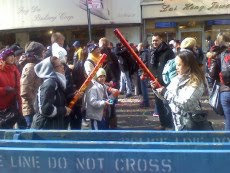 The streets were filled with confetti since people popped tubes all over the street. Daniel of course also wanted a tube. I gave him an empty tube so he wouldn't feel left out. Of course we posed for more photos while standing there. 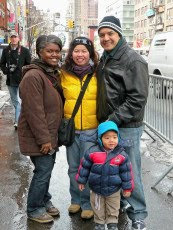 Finally we headed over to see the Cultural Festival. 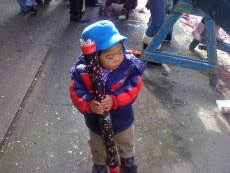 Sadly we came a bit late and missed the opening firecracker ceremony and alot of the performances. But we still enjoyed listening to the last few performances. Meanwhile, Daniel decided he was more interested in running around and enjoying the music. 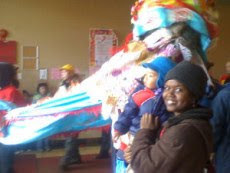 Lai's nieces bought baby dragons along the way and everyone took turns posing with them. I tried once again to get Daniel excited about the dragons. He still wasn't feeln them. Oh well. I made sure he took a photo with them anyway. LOL. After all the dragons are luck bringers. To end the day Lai gave out the little red envelopes popular during CNY. Woot! Daniels first red filled with money. Daniel shyly took the envelope...good asian kid training...and after a few minutes tried to eat it...bad asian kid training! That was my cue to take my kid home and feed him some more. 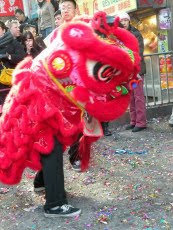 It was great to enjoy food with friends and family to start the CNY of the Tiger. Late Talkers : Are Experts & Family Right? We recently went to visit Grandma. My sister texted me a few days back that my mother was worried and missing Daniel. *rolling my eyes* Mind you my mother never called me to say any of this. 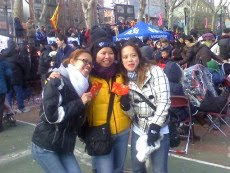 I thought about planning a weekend visit but since we're in the middle of Chinese New Year weekends are no good. My son has a busy schedule of activities. LOL. As Daniel did his thing trying to help Grandma clean and cook, my mother started telling me about my sister friends son. She went on about how he can talk and say certain words very clear. My mom felt it's cause he was in daycare and suggested I put Daniel back in daycare so he can talk faster. Hmm. Later when my uncle came he also brought up the daycare issue. He hinted that I'm holding my son back. Double Hmm. 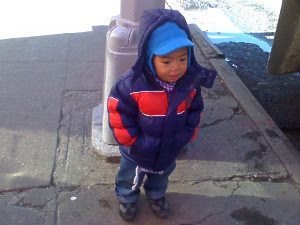 Since Daniel turned 1yr I've been fielding the "Is he talking" questions left and right. Im always hearing about some wonder 1yr old child that can say the whole alphabet, count to 10 and speak in complete sentences. Some people suggest I'm not doing enough to encourage him to talk more. Other's suggest it's because he's a boy and therefore slower to do things. Hmm. Goodness, people are always rushing children to do things. I've come to learned that Daniel does things when he's ready. He sat up, rolled over, semi crawled and walked when HE wanted to. I just had to wait. But to be on the safe side I did some reading but even the experts claim boys are slow in some areas of development. While I don't agree with the "boys are slower" way of thinking, it was comforting to read that some kids are late talker and it's normal. What's ironic is that Daniel does know how to talk. I caught him saying words and I swear he asked me "where we going" the other night. But I admit he's not very motivated to really speak. I confess I'm partially to blame. I'm so good at reading his gestures and hand signs that I forget to encourage him to "speak" his needs. Me a famous mom blogger? A friend of mine teases me by calling me that. Some people might think I am based on things I've done, places I've gone and people I've met. But this is SO not my reality. 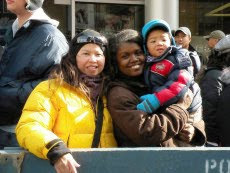 I am far from being a "famous" mom blogger. It's weird to live one way but have people see my life in a totally different way. I think it's all about the perception. I was laughing with Ana (Quiskaeya) that people need to understand that I'm still black and struggling. I'm still the same at the end of the day. Yes I attended a fancy media event for a large company. Yes I rubbed shoulders with Presidents of companies and famous "mom" bloggers. Yes, I get to shake hands and take photos with celebrity moms. But all of that is just for 2 hours! Don't be fooled by it all folks. 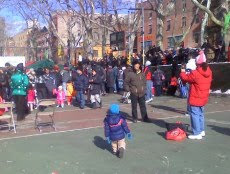 After that I come back home to my little studio apartment in Harlem (before it use to be a room I shared with family). I'm not hanging out with these people on the weekends. No celebrities are calling me to have brunch and a chat pool side. I still get my own groceries, do my own laundry and face the same struggles to make ends meet like other single moms. People need to understand that I'm not making loads of money from blogging. Heck at the end of last month I barely paid all my bills. When I tell ya'll barely, I mean barely. Matter of fact, it cost me money and time to attend a blogger event. While a few events do provide a meal and care service, most don't so I have to pay my own transportation and food. As for all expense paid blogger trips...I can't really speak about those. Yes, it's true I went on that Disney World trip but that was something out of a fairytale and amazing. Trips like that are not a regular thing. I still wonder what little wonderful bird told them to invite me for something like that. LOL. 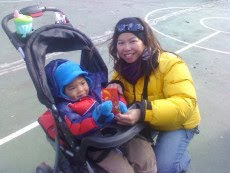 But in my everyday life the reality is...my true focus is on providing for my son. 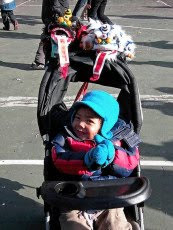 My fame and status comes from being the best mother I can for him. 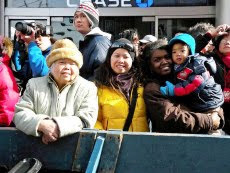 My online friends tease me about being "famous" in connection with the blasian term and for blogging about Daniel. LOL. 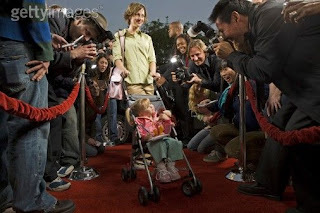 I doubt I'll be "famous" for being a mom blogger. So it's Valentines Day now. Many couples are getting their gifts ready and making last minute plans. I am doing neither of those. Don't feel sad for me. It's by choice that I'm still single this Valentine's. While I did set my self up for a date by placing dating ads and joining a few dating sites...I have yet to follow up on either. Let me be honest here...Im not an easy women to date or woo. A man has to be strong within himself to stand by my side. 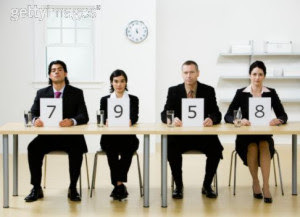 I've been at this dating process a LONG time in between husbands #1 and #2. I know what I want AS a women. I also know what some men IN a women. Now that I've become a mother, potential dates are screen through my "mommy" microscope. While I'm willing to easy up in some areas, in others area I'm hardier to impress. The happiness of my son is foremost. So finding husband #3 is going to take some work. What really am I looking for? I've watched and listened as other women expound on who mister right is for them. A lot of it is based on being rescued by love or having undying love that follows them. Mister right comes INTO their lives and everything changes. Hmm. 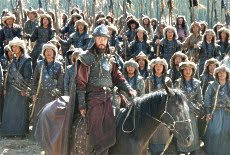 Recently I watched the Mongol: The Rise of Genghis Khan movie. As I watched it I started thinking that's the KIND of man I seek. No not specifically an man of Mongolian decent or even an Asian man to be more specific. It's NOT about a man's race, it's IS about a man's spirit. I want a man who will change the world for love. Temüjin: "I have names for the sons you will bear me"
Börte: "Do you know the Mongols"
Then she goes on to tell him all the bad things the Mongol tribes have been doing since he was sold into slavery...his reply? Temüjin: *after thinking for a while* I know what to do with the Mongols. Then he rides away...mind you he was just reunited with his family. Yet wanting to make the world a better place for them moves him to act. In that acting he became powerful. Now how many men asking me for a date has potential to be moved in that way? Some might say I'm asking too much. 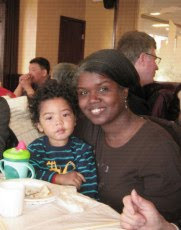 But I am already in the process of trying to change the world based on love for my son. I realized that the act of loving someone isn't just about having them come into my life. After your in my life and have become part of it...then what?! We HAD to go outside today. 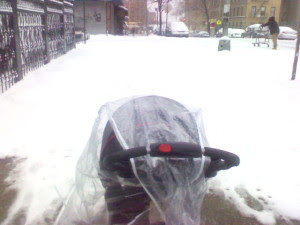 Pushing a stroller through snow is a serious workout. 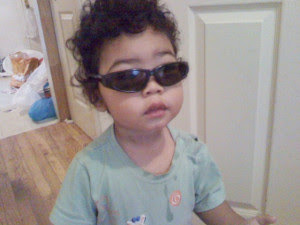 I think he's channeling the Blues Brothers, what do you think?